I saw this quote while watching The Sopranos believe it or not. So much of my written stuff is inspired by somethonf I saw on television. At first I interpreted it as “you can’t keep being phony all your life without eventually forgetting who the real you is”. That statement all by itseld is enough to make you think about your authenticity. However, after mulling it over and even praying for deeper insight, I had an “aha” moment. I am celebrating a year of quitting cigarettes. I quit on my mother’s birthday, June 21st. My mom had been beghing me to quit since she found out I started (which coincidentally was around her birthday in 2012)She had quit smoking cigarettes and marijuana in 1993. But whenever she asked me to quit, I brought up her past history. NOTE: NEVER THROW YOUR MOM’S PAST UP TO HER. IT’S A S****Y THING TO DO. So anyway, I started feeling physically drained and I was tired and irritable and just off. I went to my doctor and after telling me I’m anemic, I told him I wanted to quit smoking. He put me on meds and about three weeks later, I felt better. The first two weeks were tortuous and I wanted to go on a rampage but I made it through. I noticed that the person I was when I was smoking was far different from when I quit. I wasn’t so focused on when I could puff again or how I would pay for it. I could be the real me before I picked up the habit. I only picked up smoking because I had a stressful work and home life. My biological mom,stepfather, and youngest brother had moved in unannounced and my job demanded so much of my time, I was missing time with my rapidly growing three-year-old. I wanted to be care free and unbothered so I put on a mask. I smoked EVERY chance I got. Double time when I was out with friends. Now that I’m thinking about it, I was still missing time with my kid whenever I interrupted our play rime to smoke. In the first two weeks of quitting, I was in a daze or fog a lot. I forgot who I was and what made me actually happy. I was bewildered as Hawthorne says. A year later and I’m physically healthier and God helped me quit in preparation to carry this life inside me. Everything works for His glory. Amen. Just wanted to drop in and update you guys on my morning routine. Full disclosure: I have stopped and started this routine 2 times already. Third time’s the charm,they say. This go round I’ve stuck with it for almost a week. That’s a record for me because I drop out of self care things within a couple of days. This is different. Why, you ask? About two months ago, an ex of mine and so were catching up and he said “You haven’t changed at all in the said years I’ve known you. Don’t you want to try something different?” He was referring to my hair and clothing style,such earned him an onslaught of words that would make a sailor blush. However,he did implant in my mind that there are changes I’d like to make to my life style and well being and the way I approach it. Enter The Miracle Morning(TMM). I figure that a change in me will start when from when I wake up in the morning. Silence. You can take a silent walk(sans phone), meditate,oeay,do breathing exercises,etc. Whatever you choose,do it in silence. This gives you a chance to get dome mental clarity,focus on the goals ahead if you, and it’s strss relieving. Affirmations. Oprah does affirmations. That’s good enough for me. 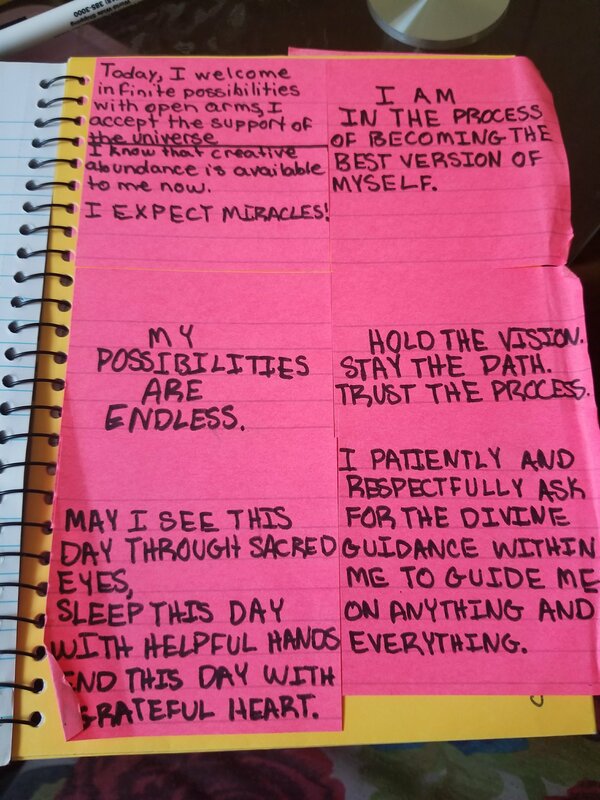 A few of my affirmations. I have night time ones as well. Visualization. Vision boards help to keep you motivated on where your trying to go and what you’re trying to do. You can choose to have a physical one where you can see it every day or an online one. Here is mine. Reading. Obvi, this one is my favorite. It’s suggested that you read something motivational or self help related. After I’m done with TMM, I’ll be reading Present Over Perfect by Shauna Niequist. Scribing. This is a journaling exercise. I use the journaling to summarize my thoughts and feelings about what I’ve learned during my MM that morning. I jot down how I’ve improved that day,changes I want to make,and one thing I’m grateful for that morning. I feel a lot more energized,motivated,and positive since starting TMM. Im moving forward career wise because I have the confidence in my abilities now. I’d say that’s a big win!